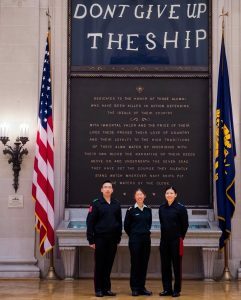 The United Naval Academy (USNA) held its 2017 Leadership Conference from 23 – 25 Jan 17 in Annapolis, Maryland. The Leadership Conference brings together future leaders from around the world for a unique three-day event intended to broaden their perspectives on leadership with this year’s theme Forging Team Spirit: Sharing the Vision. Participants included students from West Point, the United States Air Force Academy, several civilian and ROTC universities, as well as international cadets from India, Japan, Germany, and Brazil. NCdt Ho, Wilson (26584) and myself, OCdt Shin, Ashley (27116) were accompanied by LCol Owens to represent RMCC at this event. Throughout the three days, Wilson and I found ourselves on a very tight schedule, starting with an early morning workout with our hosts’ companies. Following the workout and a well-deserved breakfast at King Hall, we listened to panel discussions and participated in group dialogue. Featured speakers included the Commandants of the U.S. Marine Corps and Blue Angels, the director of FBI, Navy Seal and SWOT officers, as well as a former astronaut. The speakers shared their perspectives and experiences being in a position of leadership, where countless lives were at stake. The importance of knowing one’s purpose, taking care of subordinates, and taking daily action that will help reach your potential as a leader were some of the core messages that resonated with me. In addition, some specific themes that were brought up in discussions, such as the importance of mental health and resilience, as well as ethical leadership, are relevant and serious matters that concern all members of the forces. At the end of the event, I had a new appreciation for leaders who deal with the challenges and complexity of leadership. At the same time, I felt driven to continue developing myself personally and professionally, as I prepare to serve in the CAF as a commissioned officer. I’d like to thank the Department of the Military Psychology and Leadership and the RMC Foundation for their generosity in supporting our attendance to the conference. The opportunity to connect with other cadets from the around the world and to interact with the speakers was a highlight of my experiences as an RMC cadet.